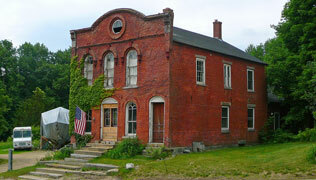 William Weed built the building in 1845 and conducted a general store there. The bricks were made at a brickyard nearby. All the steps were originally large granite blocks. Over the years, as the road running by the store changed, additional steps were added to accommodate the grade changes. 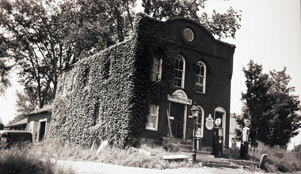 On the first floor, a general store was run out of the building until the 1970s. The Sandwich, NH post office functioned also in the building for 140 years until 1985 (the zip code was 03270). On the second floor of the building, after Mr. Weed was admitted to the bar, he had his office there. In the 1870’s, Judge David H. Hill held court there on Monday mornings. Ms. Katherine Bryer White began her antique business in a small manner there. T.D. Gotshall had his silversmith studio there for many years. In 2000, the building was purchased and is now used as a private residence. (Excerpts taken from Sandwich Historical Society Annual Excursion bulletins # 28 and 77).